New HUST Lottery – Join NOW! 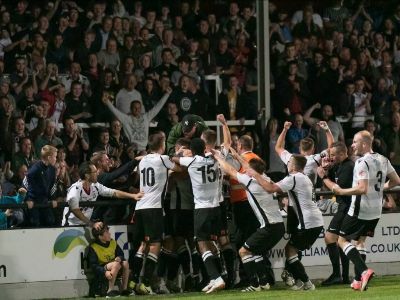 Hereford United Supporters Trust have launched a new Sports Club Lottery, an exciting lottery that gives supporters the chance to win £25,000 every single week! The new service provider replaces the old Bulls Lotto that was in operation until the end of last year. It costs just £1 a week to play, and when you join, you’ll be given a unique six-digit lucky number to be entered into the weekly draw. The draw takes place every Monday and is based on the last digit of the Fahrenheit temperature from six popular European destinations. The more numbers you match in the correct place, the more you win! Lucky winners have cheques sent out in the post automatically. Hereford supporters have a chance to win an estimated jackpot of £18.8 million in the Bulls Lotto on Saturday. The growing Bulls Lotto means Hereford fans are both helping the club, and regularly winning cash prizes as draws continue to take place on Wednesday’s and Saturday’s throughout the season. So why not join and help raise funds for the Bulls. You have a 1-in-10 chance of winning something, with cash prizes paid if you select upwards of three numbers. Prizes are on offer for matching one number or more and it’s easy to enter. Simply click https://www.lottofc.co.uk/bulls/index.htm to get started and be in with a chance of winning. If you currently enter other lotteries, why not make Hereford Football Club your “good cause” by entering the Bulls Lotto instead? You can register in less than 60 seconds with entries from £1.50 per draw. Hereford supporters have a chance to win an estimated jackpot of £8.8 Million in the Bulls Lotto on Wednesday. The growing Lotto means Hereford fans are both helping the club and regularly winning cash prizes with draws continuing to take place on Wednesday’s and Saturday’s throughout the summer months. So why not join and help raise funds for the Bulls. You have a 1-in-10 chance of winning something. The Bulls Lotto has already raised over £1,600 for Hereford Football Club, which will no doubt assist the budget ahead of the upcoming Evo-Stik Southern League Premier Division campaign. The latest Lotto Draw took place on Saturday, 1st July 2017. Winning numbers were: 02-03-15-22-35-47, plus the Star Number 8. The Bulls Lotto always provides fans with two opportunities a week to win huge sums of money in the knowledge all proceeds are donated to the Hereford United Supporters Trust and remember EVERY PENNY of the minimum 26% (39p) and a maximum of 50% of each Bulls Lotto entry that HUST receives goes to assist the growing Hereford Football Club budget. Prizes are on offer for matching one number or more and it’s easy to enter. Simply click https://www.lottofc.co.uk/bulls/index.htm to get started and be in with a chance of winning. The next Bulls Lotto draw is on Wednesday, 5th July 2017 with an estimated jackpot of at least £8.8 Million. Hereford supporters have a chance to win an amazing £19 Million in the Bulls Lotto on Saturday, 27th May. Fans are regularly winning cash prizes on the Bulls Lotto which continues to take place on Wednesday’s and Saturday’s throughout the summer months, so why not join and help raise funds for the club. You have a 1-in-10 chance of winning something. The Bulls Lotto has already raised over £1,300 for Hereford Football Club, which will no doubt assist the budget ahead of the upcoming Evo-Stik Southern League Premier Division campaign. The latest Lotto Draw took place on Wednesday, 24th May 2017. Winning numbers were: 06-13-19-25-26-44, plus the Star Number 3. The next Bulls Lotto draw is on Saturday, 27th May 2017 with an estimated jackpot of at least £19 Million. Hereford supporters are regularly winning cash prizes on the Bulls Lotto which will continue to take place on Wednesday’s and Saturday’s throughout the summer months, so why not join and help raise funds for the club. It is a rollover this coming Saturday with an estimated minimum jackpot of £6.8 Million up for grabs. The latest Lotto Draw took place on Wednesday, 3rd May 2017. Winning numbers were: 04-05-12-18-20-33, plus the Star Number 8. The next Bulls Lotto draw is on Saturday, 6th May 2017 with an estimated jackpot of at least £6.8 Million. The latest Lotto Draw took place on Saturday, 25th March 2017. Winning numbers were: 01-09-11-25-26-49, plus the Star Number 6. There were four winners in Saturday night’s rollover jackpot draw who have each scooped a cool £5 Million pounds. So, if you entered the Bulls Lotto this weekend please check your numbers as you may have won a life-changing prize, and you could even decide to donate some of your winnings! Across the network Saturday’s draw also saw twenty-one winners on the 6-number draw who pocketed £125,000 each. So why not consider joining the Bulls Lotto and thus get a chance of winning a life-changing prize in the future. The latest Lotto Draw took place on Saturday, 18th March 2017. Winning numbers were: 04-12-23-27-31-40, plus the Star Number 0. Wednesday night’s rollover draw saw even more cash prize winners at the Bulls Lotto, and you could be one of them this Saturday, 18th March – you might even scoop the jackpot. Saturday’s draw sees a whopping estimated £20 million top pay-out on offer, so why not join and have a chance of winning a life-changing prize. This massive prize makes it one of the biggest jackpots on offer in the UK this weekend. The latest Lotto Draw took place on Wednesday, 15th March 2017. Winning numbers were: 07-15-16-25-26-40, plus the Star Number 1. Prizes are on offer for matching one number or more and it’s easy to enter. Simply click https://www.lottofc.co.uk/bulls/index.htm to get started and be in with a chance of winning Saturday’s est. £20 MILLION jackpot. Saturday night’s rollover draw saw even more cash prize winners at the Bulls Lotto, and you could be one of them this Wednesday 15th March – you might even scoop the jackpot. Wednesday’s draw sees a whopping estimated £17.4 million top pay-out on offer, so why not join and have a chance of winning a life-changing prize. The prize makes it one of the biggest jackpots on offer in the UK this week. The latest Lotto Draw took place on Saturday, 11th March 2017. Winning numbers were: 04-12-17-26-46-49, plus the Star Number 8. Prizes are on offer for matching one number or more and it’s easy to enter. Simply click https://www.lottofc.co.uk/bulls/index.htm to get started and be in with a chance of winning Wednesday’s est. £17.4 MILLION jackpot. If you currently enter other lotteries, why not make Hereford Football Club your “good cause” by entering the Bulls Lotto instead? You can register in less than 60 seconds with entries from £1.50 per draw. The next Bulls Lotto draw is Wednesday, 15th March 2017.